Forget fireworks, bugs and sun burns, this natural mama's biggest fear on the fourth of July is all the crazy artificially colored foods packed with sugar that are going to be at family festivities. Don't get me wrong: I love a cute Pinterest project, but can we do it without tons of Blue 2 and Red 3? (and, you know, the risk of thyroid disease, cancer, food allergies and hyperactivity associated with them? If food coloring issues are new to you, check out this short article from the Food Network). Now, there are natural food coloring alternatives out there. Check out this great looking kit from India Tree (which I have not yet used myself but it looks pretty awesome) made from concentrated vegetable color. But when nature makes so many beautiful and tasty foods come in patriotic colors all ready, why go to the extra time and expense? 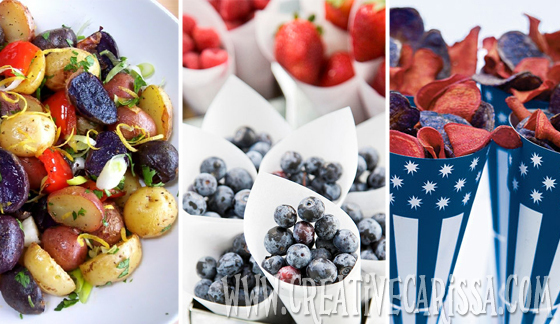 Check out some of my favorite natural Fourth of July recipes! 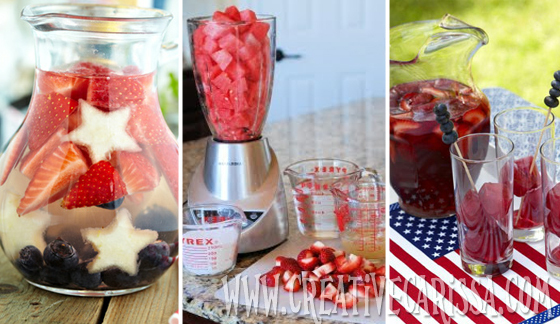 Left: Strawberries, blueberries and pineapple are the star of the show in this patriotic sangria from PunchBowl.com. Center: Make a pretty, red, watermelon strawberry lemonade following the recipe from Frosted Bake Shop (is it just me, or does this look like the best thing ever?). Right: If you're looking for something a little deeper red and less sweet, Good Housekeeping has a great recipe for Red Strawberry Tea that features red tea, strawberries and pomegranate cranberry juice. Make a pitcher for everyone and then make a seperate pitcher for the grown ups with a little something-something added in. Left: There is no summer side more classic than a potato salad. Use a mix of red, white a blue potatoes to make yours pop with this recipe from Proud Italian Cook. Center: Berries are a natural choice for a sweet side dish. Serve them simply as they come in paper cones to make it easy to mingle and snack on a small handful. Photo from Better Homes and Gardens. Right: Both potato chips and corn chips come in natural red and blue varieties (though the red corn chips are usually a result of adding tomato) that are easy to find at local supermarkets. Serve up red and blue chips with a creamy white dip. Like the fancy cones? Get the free printable here to make your own. Left: Your food doesn't need to be red, white, or blue to be festive! Download the free printables from Le Partie Sugar to dress up your otherwise plain foods. I also love her addition of colorful paper straws to add flair. 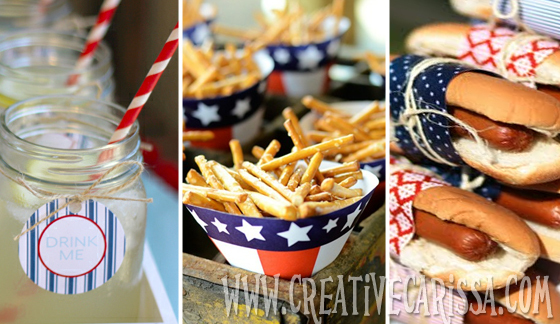 Center: Make patriotic little snack cups for pretzels, nuts or trail mix using these printable snack cups from the Mardi Gras Outlet blog. 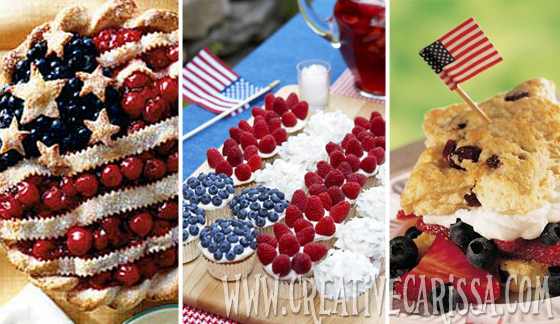 Right: Magnolia Creative Co. has a variety of patriotic printables available for free as well. I particularly love the hot dog wrappers. Left: Make a heaping cherry and blueberry pie following this recipe from Women's Day that focuses on using pre-made ingredients so you can spend more of your day enjoying your day. Center: Top your favorite cupcakes with blueberries, raspberries and coconut and arrange like a flag or follow this recipe from Good Housekeeping to make a tasty lemon cake from scratch. Right: Follow Betty Crocker's recipe for shortcake stars to make a showstopping dessert from your latest trip to the you-pick berry fields. 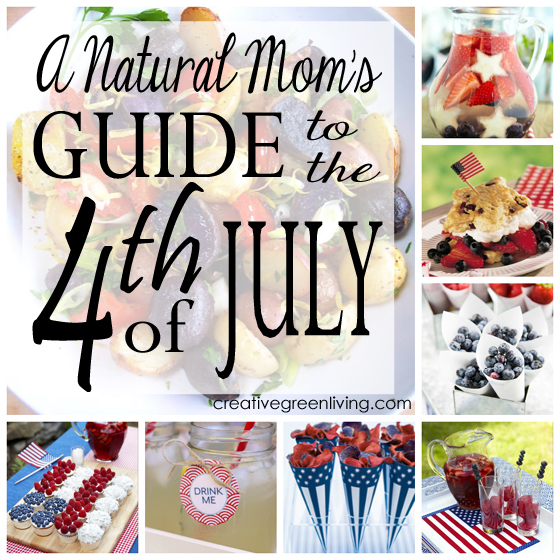 I hope whether you're a natural mama or you're just starting your journey of avoiding artificial junk in your food that you found at least one idea that will make your Fourth of July holiday a little more festive and worry free. A special thanks to all the bloggers and women's websites that featured such great content. I was delighted to feature you. If you like "featured on" swag, pick up a button here.